Norfolk Drywall was established in 1989 as a specialist drylining contractor providing a high-quality service to both the commercial and domestic sectors. 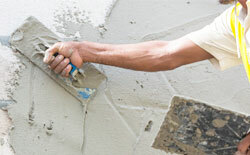 Our services include drylining, plastering, partitioning, screeding and rendering. We offer a complete professional bespoke service, tailored to your specific needs. 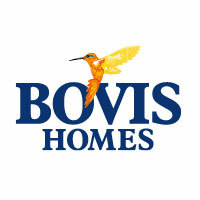 Although we mainly work with large housing developers, including Hopkins Homes, Taylor Wimpey, Bovis Homes, Orbit Homes and ISG, we also value our smaller local builders. We have successfully managed numerous projects. We deliver exceptional standards within project timescales always aiming to leave the client fully satisfied with our services. We have had the pleasure and good fortune to have worked with some of the top developers, some of those shown below. Accreditation shows our commitment to not only meeting standards of quality in construction but making health and safety matter for everyone. So what does NDW do? We have a team of industry skilled workers, working in and around East Anglia, Essex and London areas. As a company we directly employ from CITB approved apprentices, many of which we have trained ourselves to qualified tradesmen, management and admin, backed up by associated quality term served trades experience. As the regions largest dry lining company we offer a full range of drylining systems to both housing and commercial sectors. Metal Furring (MF) ceilings and walls including British Gypsum Gypliner Universal system which as with all of the MF systems can be fitted with a range of boards and in some cases a range of insulations. 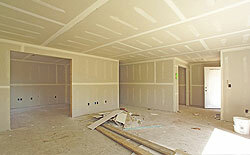 Boards once fixed can be finished in a variety of ways from “fire taping” jointing and skimming. We work to many varying specifications regarding fire resistance. We also have various options for “wet areas” ie bathrooms/shower rooms. Traditional construction such as brick and block walls can also be lined with plasterboard using a dot and dab system where a special adhesive is used to bond the walls. Having a large team of skilled plasterers who can obtain quality finishes with both one and two coat work is a true asset to us. Many of these are also very capable of producing quality external render systems from the more traditional to the latest proprietary through coloured machine applied systems. We have teams across East Anglia that produce exceptional work. We run several Putzmeister M760 screed pumps and can offer a variety of systems including modified screeds. We are fully conversant with Robust Details and the systems incorporated into blocks of flats and similar. 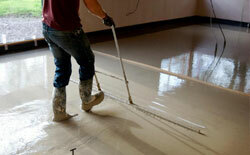 We use either a traditional hand applied method or have spray application equipment if required. 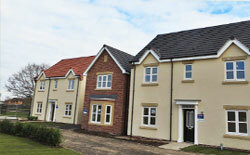 We are happy to carry out work using any of the major rendering products including KRend. All our external render beads would be either stainless steel or matching coloured pvc. Choosing the right partnerships are vital so we work closely with many of the main suppliers in the industry, so we can offer a comprehensive quality service throughout every stage of a project, from planning and specification to completion and customer service. We are always happy to hear from any company that feels they can add value to our company. Complete our general enquiry form and we will be in touch. “Many thanks – a job well done and finished on time. We look forward to working with you again”. “We would like to take this opportunity to express our appreciation for the excellent work you carried out. We have been delighted with the quality of the work and with the reliability of your team”. We are always interested in people who are interested in us. If you feel you have what it takes to fulfill our requirements then get in touch. We are always happy to consider any project regardless of its size. Use this form to submit your project enquiry. For all general enquiries , please complete our contact us form for all general and works enquiries.